CARIBIQUE® Villa Rentals is new and refreshingly different. With more than 200 Caribbean villa rentals in 17 Caribbean destinations we provide all the information and inspiration for your Caribbean villa rental holiday. But, if there are any questions left unanswered, we’ll put you directly in touch with the people best qualified to provide the most accurate answers... the villa owners! 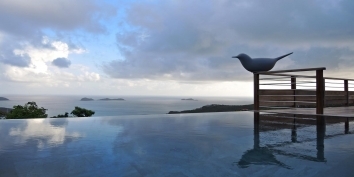 We cover all of the Caribbean’s most popular vacation rental destinations with Turks and Caicos villa rentals, St. Martin villa rentals, Anguilla villa rentals, Antigua villa rentals, St. Barts villa rentals, Dominican Republic villa rentals, British Virgin Islands villa rentals, Sint Maarten villa rentals, US Virgin Islands villa rentals, Tobago villa rentals and many, many more. Be sure to check our Caribbean villa specials for fantastic deals and savings! We’re not just unique, we’re CARIBIQUE®! From ONLY $2,650 per night! 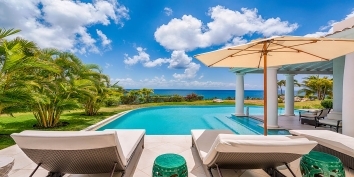 The Beach Enclave North Shore beachfront villas are nestled on a cliff with up to 40 feet (12 meters) of elevation on the island of Providenciales (Provo) in the Turks and Caicos Islands, BWI. The 4 and 5 bedroom beachfront villas each have up to 100 feet (30 meters) of private beachfront, accessed via private stairs carved in to the limestone cliff. Each of the Beach Enclave North Shore beachfront villas has a secluded beach deck, shaded by tree canopy and featuring a summer kitchen, outdoor shower and firepit. 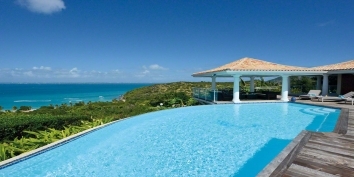 These Turks and Caicos luxury villa rentals enjoy cooling breezes and amazing ocean views. Find out more about Beach Enclave North Shore Beachfront villas, Providenciales (Provo), Turks and Caicos Islands. To see all of our fully staffed Caribbean villa rentals simply select FULLY STAFFED as a FEATURE in the BROWSE BY tool bar. From ONLY $1,880 per night! Villa Islander is a newly completed, beautifully contemporary, four bedroom villa and only steps away from magnificent Grace Bay Beach, Providenciales (Provo), Turks and Caicos Islands, B.W.I.. This vacation villa brings a refreshingly new level of tropical chic to the Turks and Caicos villa rentals market. If you love privacy, modern architecture and seamless indoor and outdoor living, you will love Villa Islander. Find out more about Villa Islander, Grace Bay, Providenciales (Provo), Turks and Caicos Islands. Whatever you’re looking for and whatever your personal definition of ‘luxury’ or ‘paradise’... we’ll help you find it. Use our intuitive browse, filter, and search techniques to find the perfect, private Caribbean villa for your perfect Caribbean holiday. If you have fixed vacation dates, simply use our availability search. You’ll be able to add and remove additional filters to dynamically refine your search results and you can choose as many features as you wish! For families travelling with children we recommend the “children welcome” feature and bargain hunters should keep an eye out for highlighted “specials available”.